The team has had two very busy but great days. On Tuesday our team began the day serving a local Honduran baptist pastor and a baptist missionary from Washington. We passed out the bags of food that we put together to families in great need. As food was distributed our team was able to pray with the families. Most of them were single moms with young children. In the afternoon the team went with the missionary to another church that has a ministry called The Cookie Project. This ministry works with malnourished children. Each day children get cookies loaded with vitamins and protein. The missionary told us that every child going through the program has gained significant weight and has shown good health except one and that child was inconsistent in participation. The children participating are 5 years old and younger. Today the team spent the day at a place called Casa de Esther in Tegucigalpa. It is a home for girls that are unwanted or from the streets. Many of them had been sexually abused. The girls ages are 13 to 19. The home is beautiful and a great environment for them to live and learn. The ladies from the beauty school of Mi Esperansa did a service project today at Casa de Esther by providing te girls with manicures, pedicures and doing their hair. It was great to see the girls get pampered. We were able to give them prayer and encouragement. God is working through these two ministries. Please pray for us as we go out tomorrow building a home and connecting with families. Pray that God will give us people to share His Good News with and connect to other believers. It was another great day for our team. Everyone worked hard preparing for a food distribution that we will do tomorrow. Team members bagged up 500 pounds of rice, 600 pounds of corn meal and 500 pounds of beans plus other items to give to 100 families. 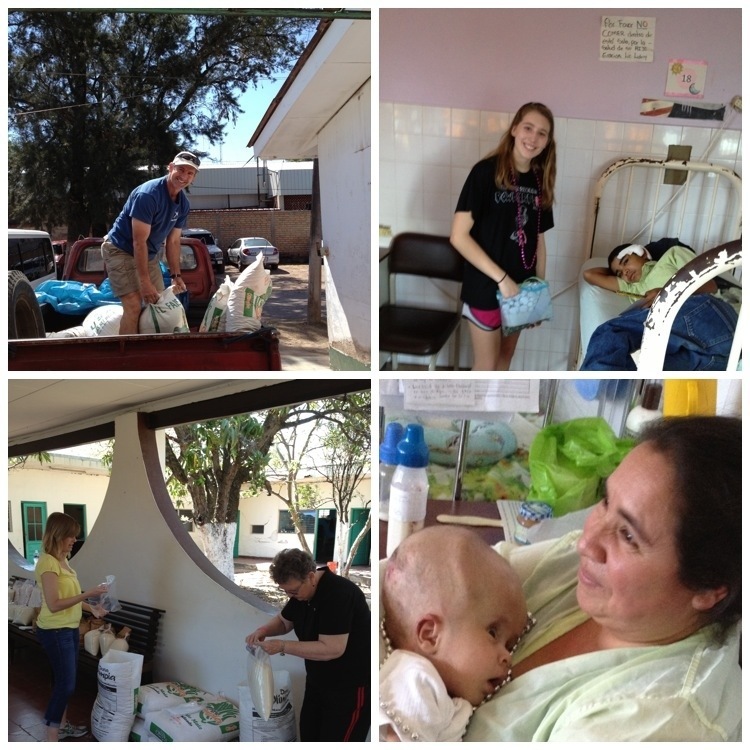 Each family will receive a unit of food that will sustain them for two weeks. The team spent the afternoon working in the children’s section of a charity hospital. The children were given fun items like coloring pages, stickers and beads. They also received hygiene packets. Most of the children we saw were in the orthopedic and surgical areas of the hospital. We were also able to visit a special unit for children with hydrocephalus. It was a powerful experience to meet the children and pray with them and their parents. Please pray for our team as we serve in Honduras this week. The team will do home construction, food distribution, hospital work with children and their families. The team has safely arrived in Honduras this morning and getting set to serve. Team members are: Kylie Bauer, Rodney Breaux, Sharon Gauthreaux, Lynn Hall, Terri Higdon, Janet Hines and Glynn Robinson. Please pray for our FBC Covington mission trip to Honduras. Our team will depart on May 16. God has given us the opportunity to serve through home construction, food distribution and community outreach. God gets all the glory as His people respond to His call and GO in His name.